When an application’s capacity exceeds that of standard RS series roller chain, Heavy Series Chain delivers the same strength as a larger sized standard RS chain. When higher horsepower, higher tensile strength or an increase in maximum allowable load is required, turn to Tsubaki Heavy, HT, Super and Super Heavy Series. Tsubaki offers a robust line of Heavy and Super Series Chains which will solve your specific driving and conveying problems relating to heavy shock load and/or space limitations. Heavy Series Chain link plates have the same thickness as the next size up standard ANSI chain providing approximately 10% greater shock load capacity. Pins are through hardened for sizes up to 140. For sizes above 140, the pins are case hardened. HT Series Chain provides 15%-30% increase in tensile strength over standard ANSI chain by using through hardened pins and link plates of the next size up chain size. The dimensions of the chain are identical to those of the ANSI Heavy Series roller chain. 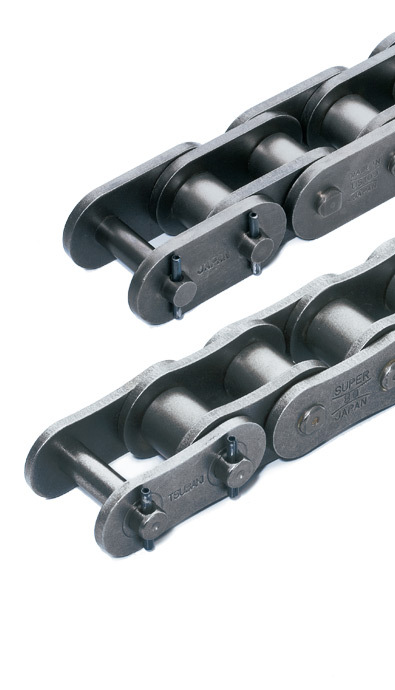 Super Series Chain has a wider link plate waist, through hardened pins, critically formed and ball drifted link plate holes which all provide 30% greater horsepower ratings and greater shock resistance over standard ANSI chain. Super-Heavy Series Chain shares the wider waist properties of Tsubaki’s Super Series chain. 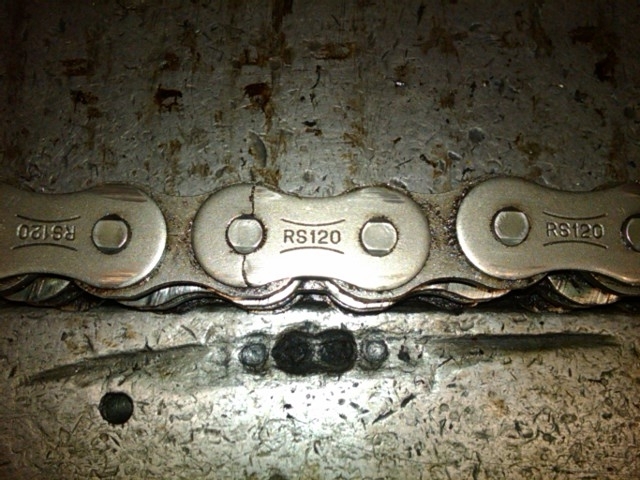 The link plates, however, have the same thickness as the next size up Super Series chain. 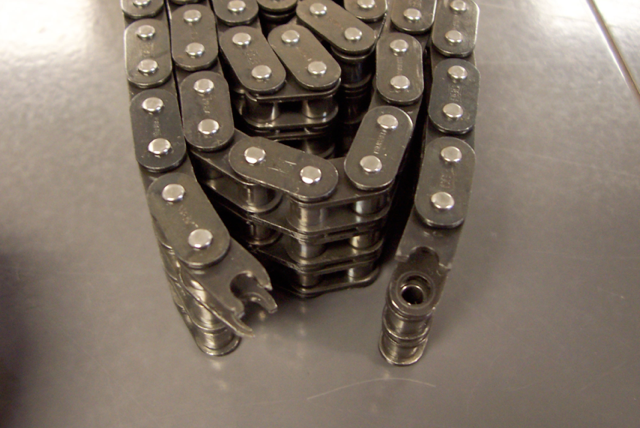 The same special manufacturing techniques used in Super Series Chain are used to produce the link plate holes for Super Heavy series chain. Pins are also through hardened and Super-Heavy Series has an even higher maximum allowable load than Super Series. The customer has had chain breakage problems using RS100-2 chain with their Saw Infeed Conveyor Drive. The chain failure was caused by excessive loading and speed causing rapid elongation resulting in the chain skipping sprocket teeth. The chain tension calculation revealed that the application load was way too high for the chain capacity. The customer would have to replace their chain every 8 months incurring 2.5 hours of replacement time plus the application downtime cost involved with the replacement. To cater to the higher load, Tsubaki suggested RS100-3 to support the application’s requirement. Unfortunately, the customer did not have sufficient space needed to accommodate the wider strand of chain that the solution required. To keep the same chain size while upgrading the capacity, we recommended Tsubaki RS100-2 Super Series Chain as well as modified sprocket sizes to reduce chain speed. The cost of the Super Series Chain was almost doubled compared to the standard RS chain. However, the customer saw extensive increase in life of the application from 8 months to 3.5 years and counting. By replacing their chain to one of Tsubaki’s VIP products the customer saved over $2,000 and counting! Chains are designed to transmit units from one point to another. In the case of a drive chain, it transmits power between one or more rotating shafts. In the case of a conveyor chain, it transmits material from one point to another using the same method. In both cases, they are designed to pull a predetermined amount of load based on their size, material, heat treatment, etc. Generally, maximum pull is divided broadly into two categories: tensile or fatigue. Tensile strength is defined as the load that when applied once will cause a chain to fail; a massive one-time overload. On the other hand, a chain’s fatigue strength is defined as the chain’s ability to withstand continuous load without failure. Exceeding both values will ultimately cause the chain to fail. Visual examination of a fracture can generally determine the type of failure. A tensile fracture usually involves a large amount of deformation. For lack of a better term, it often looks like the chain has been physically pulled apart. A fatigue fracture on the other hand usually takes place on the link plate within 30° of the pitch line. It is a cleaner break with little to no visible deformation. You can see examples of both cases below! Chain that fails due to Tensile or Fatigue fracture requires different design criteria than chain that fails due to elongation. Components that are designed to reduce the rate of wear, must instead be designed to increase strength. There is generally a trade-off here; chains that are designed with higher strength ratings generally do not wear as well as standard. Tsubaki manufactures two series of chain to increase strength: SUPER and SUPER-H.
SUPER chain features through hardened pins, increased waistband, quad-riveted pins, and ball-drifted pin link plate holes. All these features result in a maximum allowable load 30% higher than standard chain. SUPER-H chain features all the same features as SUPER series with the addition of HEAVY side plates (thickness increased to that of the next size up). The result is a chain with 23% higher tensile strength. Both series are available in single, double, and triple strands. All SUPER series and SUPER-H single strands run on single strand sprockets. Double and triple SUPER-H chains require HEAVY sprockets due to increased transverse pitch. Speed should be limited to 160 feet per minute.